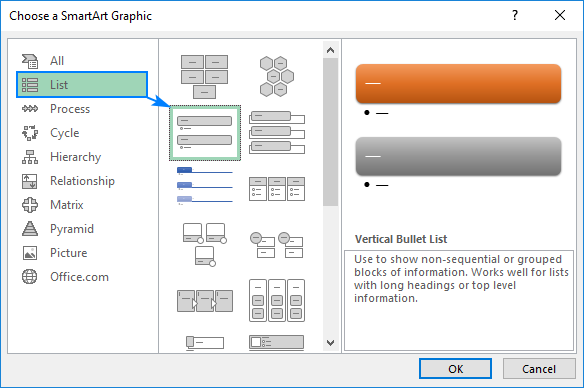 The tutorial shows a few simple ways to insert bullet in Excel. We will also share some tips on how to quickly copy bullets to other cells and make your custom bulleted lists. Microsoft Excel is primarily about numbers. But it is also used to work with text data such as to-do lists, bulletin boards, workflows, and the like. In this case presenting information in a right way is really important. And the best you can do to make your lists or steps easier to read is to use bullet points. The bad news is Excel does not provide a built-in feature for bulleted lists like most word processors including Microsoft Word do. But that doesn't mean there is no way to insert bullet points in Excel. In fact, there are at least 8 different ways, and this tutorial covers them all! 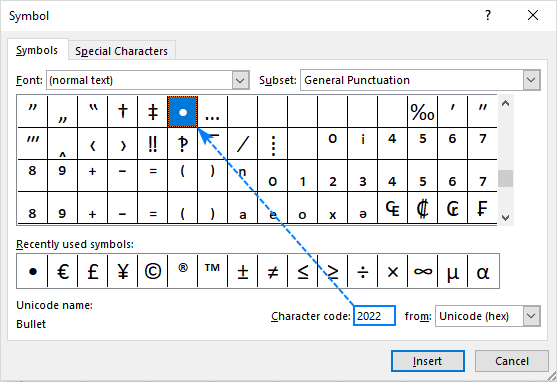 The quickest way to put a bullet symbol into a cell is this: select the cell and press one of the following combinations using the numeric keypad on your keyboard. ● Alt + 7 or Alt + 0149 to insert a solid bullet. ○ Alt + 9 to insert an empty bullet. 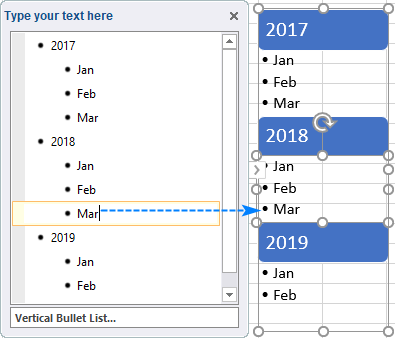 To repeat bullet points in non-adjacent cells, select a cell with the bullet symbol and press Ctrl + C to copy it, then select another cell(s) where you want to have the bullets and press Ctrl + V to paste the copied symbol. If you are using a laptop that does not have a number pad, you can turn on Num Lock to emulate a numeric keypad. On most laptops, this can be done by pressing Shift + Num Lock or Fn + Num Lock. To add a bullet symbol to a cell that already contains text, double-click the cell to enter the Edit mode, place the cursor where you want to insert the bullet, and then press Alt + 7 or Alt + 9. In case you need to conditionally format your bulleted list or apply some formulas to it, say to count specific list items, it is easier to do if the items are normal text entries. In this case, you can put bullets in a separate column, align them right, and remove the border between the two columns. Select a cell where you want to add a bullet point. Optionally, select the font of your choosing in the Font box. Or, go with the default (normal text) option. 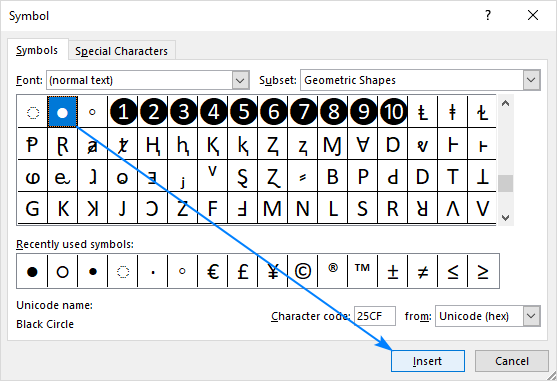 Select the symbol you'd like to use for your bulleted list and click Insert. Close the Symbol dialog box. Done! In case you have already created a bulleted list in Microsoft Word or another word processer program, you can easily transfer it to Excel from there. 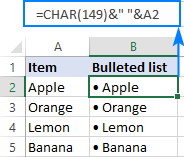 To insert the entire list into one cell, double-click the cell, and press Ctrl + V.
To put list items into separate cells, click the cell where you want the first item to appear and press Ctrl + V.
In situations when you want to insert bullets into multiple cells at a time, the CHAR function may prove helpful. It can return a specific character based on the character set used by your computer: Windows-1252 on Windows and Mac OS Roman on Mac. Select all the cells where you want to put bullet points. Press Ctrl + Enter to insert the formula into all the selected cells. This method comes in especially handy when you already have some items in another column and you want to quickly create a bulleted list with those items. To have it done, concatenate a bullet symbol, space character, and cell value. Tip. If you'd rather have your bulleted list as values, not formulas, fixing this is a matter of seconds: select the bulleted items (formula cells), press Ctrl + C to copy them, right-click the selected cells, and then click Paste Special > Values. Select the cell where you want to put a bullet point. 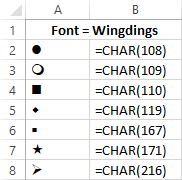 On the Home tab, in the Font group, change font to Wingdings. You can insert even more bullet symbols by using the CHAR function. The point is that standard keyboards have only around 100 keys while every font set has 256 characters, meaning more than half of those characters cannot be entered directly from a keyboard. 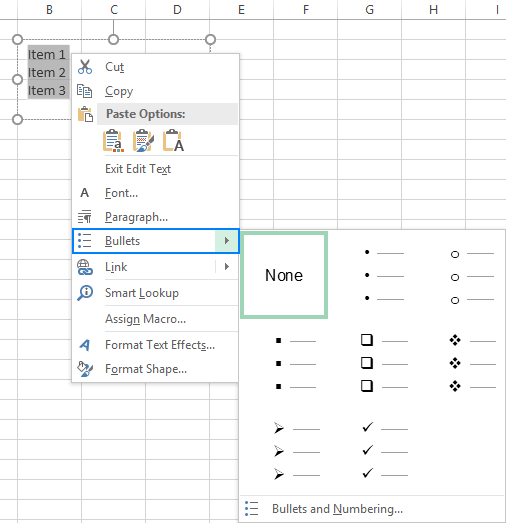 If you want to spare the trouble of inserting bullet symbols into every cell over and over again, make a custom number format that will insert bullet points in Excel automatically. Press Ctrl + 1 or right-click the selected cells and choose Format Cells… from the context menu. On the Number tab, under Category, select Custom. "● @" (solid bullets) - press Alt + 7 on the numeric keypad, type a space, and then type @ as a text placeholder. "○ @" (unfilled bullets) - press Alt + 9 on the numeric keypad, enter a space, and type the @ character. 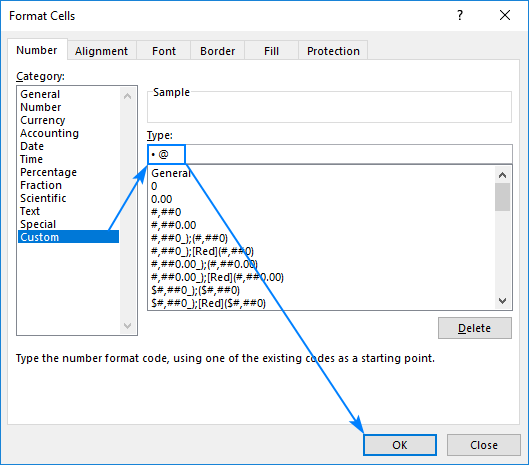 And now, whenever you want to add bullet points in Excel, select the target cells, open the Format Cells dialog, select the custom number format we've just created, and click OK to apply it to the selected cells. You can also copy this format in the usual way using Excel's Format Painter. In the worksheet, click where you want to have the text box and drag it to the desired size. Tip. For the text box to look tidier, hold the Alt key when dragging to align the edges of the text box with the cell borders. Type the list items in the text box. Now, you can take your pick of any of the redefined bullet points. 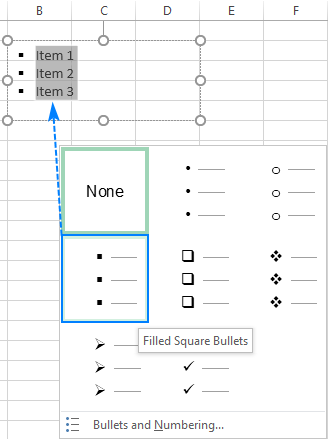 As you scroll over different bullet types, Excel will show a preview in the text box. You can also create your own bullet type by clicking Bullets and Numbering… > Customize. 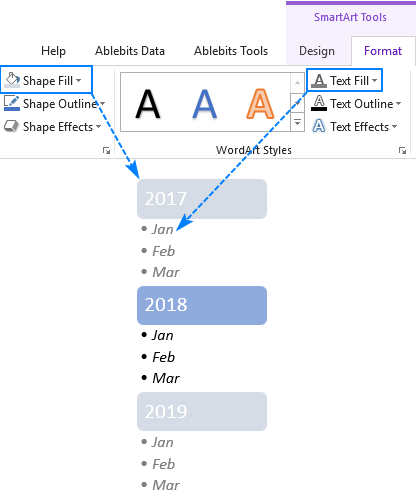 The best part is saved for the last :) If you are looking for something more creative and elaborate, use the SmartArt feature available in Excel 2007, 2010, 2013 and 2016. Go to the Insert tab > Illustrations group and click on SmartArt. Under Categories, select List, click the graphic you'd like to add, and click OK. For this example, we are going to use Vertical Bullet List. When finished, switch to the SmartArt Tools tabs and craft your bullet list by playing around with colors, layouts, shape and text effects, etc. These are the methods I know to insert bullet points in Excel. If someone knows a better technique, please do share in comments. I thank you for reading and hope to see you on our blog next week! 10 Responses to "8 ways to add bullet points in Excel"
I've been having trouble with this process for ages. I don't have a number pad on my laptop, and even using short keys to enable number lock etc. didn't work. Your blog is the best. I read the first instruction, tried it and it worked like a charm. Excellent. Thank you. Amazing how little things can make on so happy. Me too, have been in need of bullets in Excel for ages, and when I read this advice and tried it out, was very very happy! Thanks so much! You are awesome!!!!!!!!!!! Thank you for posting the options. SUPER helpful - this goes into the top of my toolbox. Thank you!! I want to write 004.569 or 005.5689 4 in excel, how can i write it in excel?